Unionist disquiet appears to be growing over planned changes to Northern Ireland’s electoral boundaries. An Ulster Unionist MP declared that the planned alterations are a needless case of “major surgery”, whilst a former UUP leader said the blueprints bear “little resemblance” to the Province’s current political map. Meanwhile, a DUP MLA said it is “ridiculous” that the name of Londonderry looks set to be scrapped from his constituency under the plans, unveiled on Tuesday by the Boundary Commission for Northern Ireland. As reported, the commission has drawn up a draft map of how Northern Ireland’s new constituencies would look. The shapes and names of many of them would change drastically. Among the many examples is the idea that East Londonderry would be amalgamated with much of Mid Ulster to create a new constituency called Glenshane. Meanwhile Belfast South would disappear, and be incorporated into Belfast East and a new constituency called Belfast South West. It had been suggested by a DUP source that Fermanagh and South Tyrone may be more vulnerable to being seized by Sinn Fein in a Westminster election under the proposals, which involve axing Dungannon town from the constituency, and adding a large rural belt stretching from Fintona to Castlederg. “They’ve carried out major surgery in areas where there was no need to,” said Tom Elliott, the UUP MP for the constituency . Under the plans (see sidebar), the Province would lose one of its current 18 constituencies. This “didn’t mean they had to make the vast changes that they have”, said Mr Elliott. He had beaten Sinn Fein to victory last year in the seat by only a very slender margin, and he was asked on Tuesday if he would feel confident about winning again if the plans – which are open to public consultation – do come to pass in their present form. “I think the point is many people didn’t give me any chance of winning it the last time,” he said. Former UUP leader Reg Empey said that he was concerned that the new boundaries would leave some urban centres like Ballymena and Lisburn “cut off from their natural hinterlands”. Meanwhile, 10 of the constituencies would “bear little resemblance to what went before”. Asked about the proposal to create a new Glenshane constituency where his current East Londonderry one lies, Adrian McQuillan, MLA said: “I think it’s a bit ridiculous. It’s just another way of getting rid of the name Londonderry. He said it was “early days yet” when it comes to assessing the possible effect of the changes on unionists’ electoral chances in the region. WHAT IS GOING ON, WHY, AND HOW CAN I HAVE MY SAY? The proposed changes come against a backdrop of a planned cut in the number of MPs. This dates back to 2011, when the Parliamentary Voting System and Constituencies Act was enacted. This made provision for the UK to slash its MPs from 650 to 600. All UK regions announced boundary reviews this February. Under the Northern Irish proposals, the number of constituencies in the Province would drop from 18 to 17. This would affect both Westminster elections (when one MP per constituency is elected) and Assembly ones (where multiple MLAs are elected). 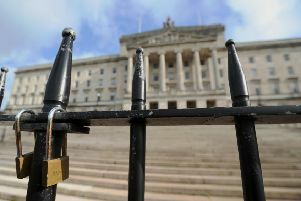 The Boundary Commission’s proposals for Northern Ireland are an attempt to keep the number of people per constituency fairly even, and to avoid some having much bigger electorates than others.